Sam Concepcion on his new album: &ldquo;It&rsquo;s going to differentiate me from my previous self.\"
Sam Concepcion on his new album: “It’s going to differentiate me from my previous self." “The music part and the acting part, they’re still one for me… it makes me who I am as an artist.” Stepping out of his Little Big Star rep, Sam Concepcion is slowly discovering where his strengths lie. If anything, he has a firmer grasp of himself as an artist. 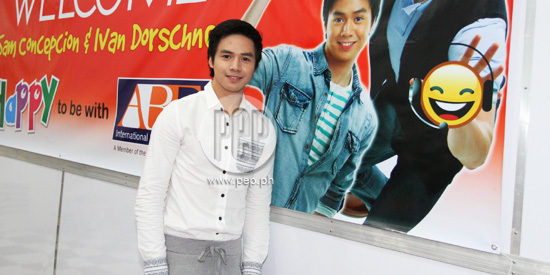 Much is in store for Sam Concepcion this year as he stars in Chris Martinez’s silver screen musical, I Do Bidoo Bidoo. In the film, Sam gets to act alongside the OPM greats Ogie Alcasid, Gary Valenciano, Zsa Zsa Padilla, and award-winning actress Eugene Domingo. Sam portrays the role of Rocky Polotan, eldest son of Rose and Pol (Eugene and Ogie), who gets his girlfriend, Tracy Fuentabella, pregnant. Young theater actress Tippy Dos Santos plays the character of Tracy. The 19-year-old was up to the challenge. In PEP.ph’s (Philippine Entertainment Portal) interview with the former Little Big Star Season 1 champion (April 2, at Johnny Rockets, Tomas Morato), Sam talked about his plans of slowly moving away from his teenage image. He reckons the downside to starting young in showbiz is getting “stuck there.” The challenge, he says, as he turns 20 years old in October this year, is to “reinvent” himself. NEW ALBUM. Among his projects this year is recording a new album. “I’m really working on this next album,” says Sam. “It’s going to be really important. More important than any of the albums I’ve made. While they have not started recording yet, Sam says his duet with “Asiansation” balladeer Christian Bautista will be in the tracklist. The new album will also include Sam’s own writings, as well as collaborations with other international songwriters, producers, or artists. Sam adds that he also wants to release a dance album. The young singer-actor is certain that music is for him. “What would I be doing if I weren’t doing this? I don’t know. "I would probably be doing… music. Nothing’s going to stop me from singing or writing songs,” stresses Sam. SINGING VS ACTING. Sam says he would choose singing over acting any day. However, he is grateful for the project, I Do Bidoo Bidoo, which allows him to do both. “I think it’s great that I’m given a project where I can showcase both, I guess. It’s cool that I get to sing and act. “I’m not sure if I love one over the other. They kind of go hand in hand. “The music part and the acting part—they make up who I am as an artist. ON HIS THEATER TRAINING. Sam received his first formal acting and singing training in the theater company, Trumpets. He has starred in the plays, The Lion, The Witch, and The Wardrobe, High School Musical on Stage! and most recently, Peter Pan. Traversing theater and screen acting, Sam says, is quite an experience. “Shifting [from theater to film acting], I only realized how… not simple it is, not too long ago. “Kasi siyempre I started sa theater, I entered the singing contest …and then…acting for TV, [even] recording was different from singing on stage and acting on stage. “So, recently lang that I realized how different they are… But I guess my background in the theater helped me a lot. It taught me how to sing, gave me stage presence. “Before, when I was still starting out, medyo blurred pa yung… lines [between] acting and singing on stage and on TV."